Mustard, a member of the brassica family, is grown as a heated addition to salad greens and the ground seeds make the base for the condiment. It is a cool season crop, running to seed very quickly in warm weather, the leaves growing coarse in areas of high rainfall. In temperate climates, outdoor sowings are more successful in spring and autumn. Seed can be planted in shallow drills but are successfully grown in any vacant patch left after the removal of a crop, simply broadcast, rake over and water. The seeds germinate rapidly and growth can be seen in a few days. Under cover, mustard can be grown from autumn to spring by sowing on moist paper towelling in a tray or in a container with potting mix. There are enough nutrients within the seed for germination and growth to well past the shoot and two leaf stage, when they can be harvested. 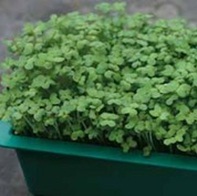 Sowing every week will provide a continuous supply, cutting when the seedlings are 2-3 cm tall. 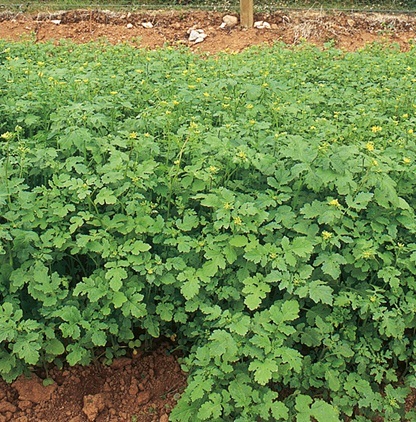 A very good use for mustard is as a green manure crop. Rather than leave soil bare after harvesting the crop, broadcast the seed over the plot and rake in lightly. When the seeds have germinated and are well under way, the plot can be dug over and the plants turned in. The decomposing plants break down and lose their structure to form humus. Humus may provide little by way of nutrients but benefits the soil by its ability to hold water, help form a good tilth and maintain air spaces.